Search engine optimization (SEO) is a highly effective and profitable way to get a higher position in the search engines. If your position in the search engines will get higher, your websites visitors will increase. It is not only important that your visitor numbers are rising, it is more important that the visitors rose because your website is found on the right keywords. This is an important fact which many Internet marketers make a mistake with. Most important for you as a company is that the number of leads that will later lead to customers will increase. How do SEO companies provide services to their clients? First they make an analysis of your website. In this analysis they will find out on which keywords the website can be found at the moment. On this basis, they will make a search engine optimisation plan and a proposal. Professional internet marketing companies always discuss this report with the client and discuss the possible improvements such as: on what keywords the website wants to be found and all the improvements which can be made. 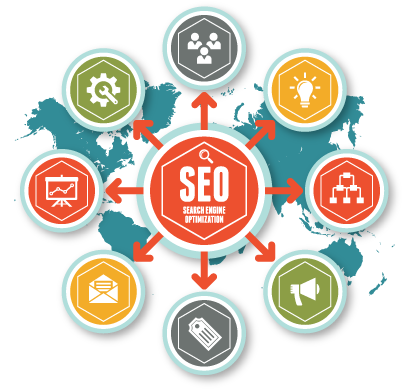 In selecting the keywords the client will have an input and also SEO agency will advise the client accordingly. After the website is fully optimized on the right keywords, then they will begin with link building. Link building requires 90% from the time which has to be put in search engine optimization and is by far the most important factor to get higher in search engines. This will be updated monthly. It depends from your competition how many hours per months SEO consultants should have to spend on link building. Link building is spreading your link over the web. Your link will be located on other websites which are relevant to your website. Also, the site will get add to several directory sites, this will also generate visitors to your website. Experienced online marketing agencies always ensures that the websites where your link will be posted will be websites with relevant topics related to your industry. As another service, most of SEO Solution companies also create a company page in Google Maps. This page is filled up with information, photos and videos of the company. After creating this page, it will get optimized so beside your website, your Google maps page will also get found in Google. This service is not an organic way of receiving online traffic & business through search engines. In simple terms on this method search engines charge a fee to place your add (adword) in right front of potential clients, and targeted traffic depends on the customer’s requirements how much monthly budget client allocate. The customer can choose his budget and online marketing guru’s will create a strategy so the Google Adwords advertisements will appear on the right pages so the website will get more business-oriented visitors. Search engine optimisation specialist makes always sure you get every month a rapport with it in all the statistics of the website. In these statistics you can see what work has been done and how many visitors have visited the website. You can also see where the visitors come from, how long they have been on the website and how they have found the website. It is a comprehensive report that you can clearly see that the visitor numbers go up and that the approach is working.